When purchasing or obtaining backlinks, it’s great to have backlinks from diverse IP ranges rather than from similar class C IP blocks. Also it maybe useful to obtain links from IP’s within a specific geo-location when doing local SEO, for example if you are trying to rank a local business in the UK targeting sites hosted in the UK with UK domains can be beneficial. Also this addon is great for uncovering competitors link networks and their other websites, you can load in your competitions backlinks (Which can be obtained with the ScrapeBox Backlink Checker Addon) and scan them to find sites hosted on the same or similar IP’s to reverse engineer their backlink profiles. 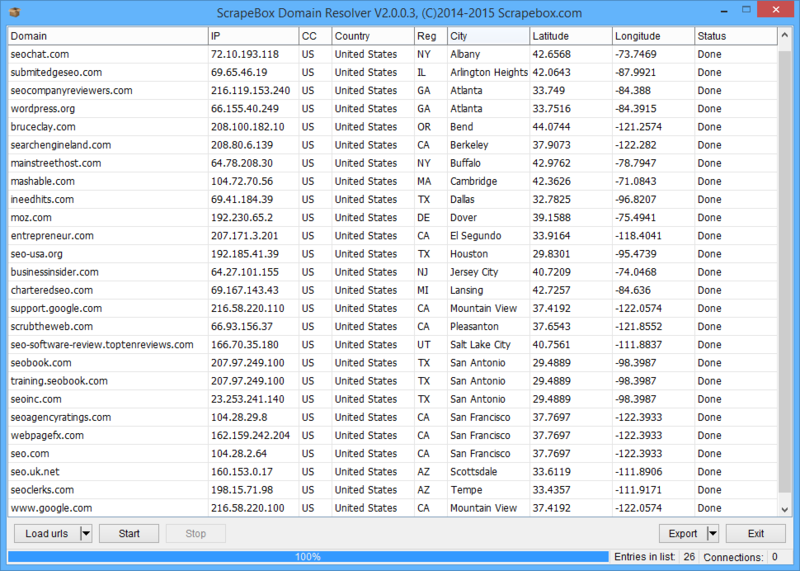 The ScrapeBox Domain Resolver Addon is able to take a list of URL’s and resolve them to their IP address and geographic location very fast, it’s possible to scan and resolve thousands of domains per minute via the internal geo-ip database and the addon not needing to rely on any third party lookups. It’s also possible to load a list of email addresses, and have the domain resolver lookup the domain associated with the email address. So this can be used as a basic check to ensure email lists are associated with a valid domain. Once installed you can load a list of URL’s and click “Resolve” and the Domain Resolver Addon will scan each URL and fetch the IP address and location of the server. Once the domains have been checked, you can click the column headers to sort via IP, Name or Location or save the results to numerous file formats such as TXT, CSV, XLSX files for further analysis in programs like Excel or Notepad. This tool is included free for ScrapeBox owners. View our video tutorial showing the Domain Resolver in action. This is a free addon included with ScrapeBox, and is also compatible with our Automator Plugin.